Cloudsorption panels are suspended horizontally from a structural ceiling giving more of a ‘cloud’ effect. This method of installation is a far more efficient way of reducing reverberation within a room because it will absorb noise from both below and above the panel. 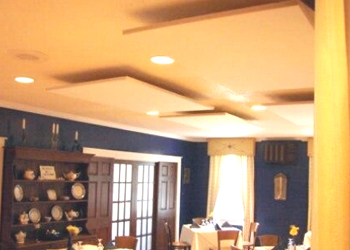 Cloudsorption suspended sound absorbing panels for ceilings are a step forward from the more standard tiles applied directly to ceilings or into suspended ceilings. Cloudsorption panels are suspended horizontally from a structural ceiling giving more of a ‘cloud’ effect. This method of installation is a far more efficient way of reducing reverberation within a room because it will absorb noise from both below and above the panel. This enables lower frequency noise to be more easily absorbed because of the air space between the top of the Cloudsorption panels and the underside of the ceiling. This easy to install method of fixing enable the acoustic panels to fit beneath electrical fittings and any other services that may already be installed onto ceilings. This system of installation will fit more easily beneath ceilings that have thermal cooling under BREEAM initiatives. Cloudsorption sound absorbing panels are ideal for use in schools, offices, music studios, shopping arcades, airports, restaurants or any area where a new innovative look is required. Cloudsorption – Echo Plus is similar to our Echosorption Plus acoustic tiles available in 1200 x 600 x 30mm panels produced from high density sound absorbing core with a factory applied white speckled finish on the face side. This panel has bevelled edges to give it a more pleasing appearance. Each panel is supplied with 4 screw hook eyelets which have to be screwed into the back of the panels for suspension. The panels are supplied 8 to a box and the minimum quantity available is one box. With each box we supply 32 eyelets to be fitted by the installer on site. The number of eyelets, hooks and cables vary according to the size of the panel as follows. We can also supply this product in shapes such as triangles, circles, pentagons, hexagons and so on. Please call us for more information and prices.